Miranda's Mumbles, Murmurs and Mutterings: Oprah Winfrey in LONDON ! So I only heard on Saturday night that Oprah Winfrey is / has been in London in the last few days. She is by far one of the most powerful and influential women in the world and certainly THE most powerful woman in the USA. I enjoyed watching her interview on the Jonathan Ross Show and as I write this, I am also watching her being interviewed by Lorraine. To say she is hard working is an understatement - if we all worked as hard as she has done, our productivity would go up by about a trillion percent. 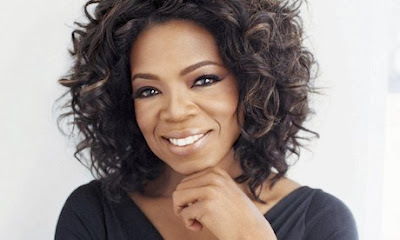 For TWENTY FIVE years, she carried out two interview shows every single day - the famous Oprah Show. She has changed hundreds of thousands of lives. She is worth almost $3 billion. Mind boggling. I read somewhere that "her profound influence over the way people around the world read, eat, exercise, feel and think about themselves and the world around them is much more difficult to calculate". I am SO excited about her new film The Butler - I can't wait to go and see it. I don't ever make time for the cinema - I saw About Time about 6 weeks ago and that was the first trip I had made to the cinema in years (I have great difficulty in sitting still but it was well worth it). I will go out of my way to see this. She is about to be awarded with the highest civilian honour in America - the Presidential Medal of Freedom. Sounds to me like she thoroughly deserves it.